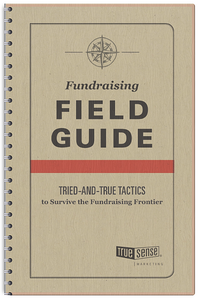 If you’re one of those fundraisers who gets excited by the creative work, this excerpt from The Fundraising Field Guide — dedicated to the creative secret sauce — is for you. Especially in this rapidly evolving digital age (with new ways to talk to and reach different audiences), marketing is changing every day. But there are some fundamental truths that have been around for a long time and will stick around for generations to come. They extend to any channel and any interest — commercial and nonprofit. And lucky for us, there’s an acronym to help remember them. It’s called the AIDA model, and it stands for Attention, Interest, Desire, and Action. If you’re reading this before you read the paragraphs above, then this attention-getting tactic worked. (Now go back and read those paragraphs above.) Because bold uppercase letters command attention. If you don’t have someone’s attention, then all the other techniques and tactics don’t matter. So how do you get a donor’s attention? There are several different approaches, and you have to test to find out what works best for you. But what kind of Field Guide would this be if we didn’t offer up a few good ones to try? Personalizing — It’s hard not to read something that has your name front and center. Disrupting — Say or show something that simply can’t be ignored. Standing out — Try different formats, like a direct mail package that stands out in the mailbox, or an ad that looks completely different from the pages it appears on. Showering them with gifts — People love free stuff, but beware going down the premium road. Try to offer something that ties in to your mission or, better yet, gets sent back (like a bounceback). Creating mystery — It’s important to remember that sometimes, things stand out because you don’t know who they’re from. So every now and then, try that blank envelope test. Now that you’ve gotten their attention, you have to hold their interest. Don’t bore them with statistics or programmatical information. Limit or exclude organizational “we” talk. Remember, it’s about them. Tell a compelling story, and show how they can make a difference. Break up long sentences and paragraphs. Keep your copy concise and conversational. You’re almost there! You’ve gotten their attention AND you’ve kept their interest. Now you have to make them want to be a part of what you’re doing. Here’s the good news: Most people really do want to help. They have a heart for helping people (or furry friends), and they want to make a difference. Remind them of that and of what kind of people they are.